The book came in prime condition-worth the the 99 cents+shipping I paid. No scratches or markings, and it was still bound nicely. It did take longer than I wanted to come, but when it did it was worth my money. A must read for all Riordan Fans!! 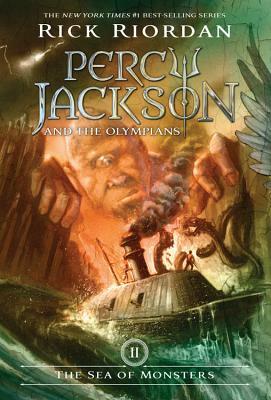 This novel, written by Rick Riordan, is the second installment in the "Percy Jackson and the Olympians" Series. This book was my favorite book out of the series (5 Books Total), because the characters start forming their true personalities, relationships are becoming concrete and the imagination that I encountered was far greater than most of the books. The book takes off with Percy enrolled in a school where if you screw up, you pass (I guess fundamentals are a little obscure at this school). Anyway after a series of unfortunate and yet crazy things happen to Percy and his new friend Tyson, Annabeth shows and tells Percy that Camp-Half Blood is losing it's border power and must do something that will prevent the camp from being destroyed. Percy, Annabeth and Tyson go on a quest to the Sea of Monsters in order to save the camp and.... Grover?! ?Powdered donuts," Tyson said earnestly. "I will look for powdered donuts in the wilderness." He headed outside and started calling, "Here, donuts!? I say it was very action packed. I loved the part where Percy and his friends where battled the Hydra!!!!!!!!!!!!!!!!!!!!!!!!!!!!!!!!!!!!!!!!!!!!!!!!!!!!!!!!!!!!!!!!!!!!!!!!!!!!!!!!!!!!!!!!!!!!!!!!!!!!!!!!! If you loved the first, then you'll fall in love with Sea of Monsters. If you loved Rowling's Harry Potter books, heres an equal love. A gripping, second addition to the Percy Jackson series. Its a must read.